»Double Dutch»See a Double Dutch Competition Live at the Apollo! 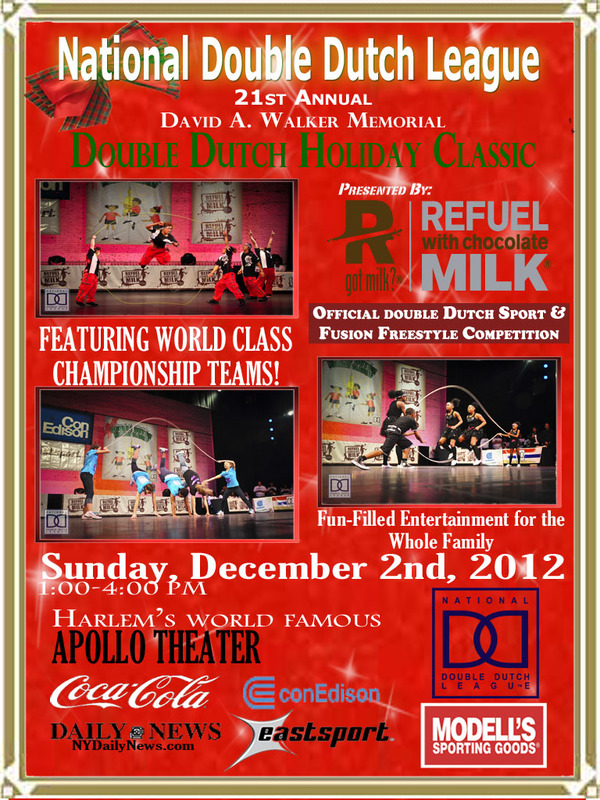 The biggest and the best double dutch competition is coming to the Apollo on Sunday, December 2, 2012! The National Double Dutch League (NDDL) will host its 21st Annual Double Dutch Holiday Classic. I can testify that this is the best, because I was was able to witness the greatness of this event first-hand. If you think the sport, double dutch is jumping between two ropes, you need to see how this sport has evolved. It has grown beyond the streets of New York City and is now an international phenomenon. In fact, Japan has won the “Best in Show” award every year since 1996 except during 2001 following the attacks of 9/11 when they did not compete and in 2004 when Brooklyn’s Jumpers in Command were victorious. The NDDL is also working hard to promote double dutch as an Olympic sport. Read about the competition in the Double Dutch newsletter HERE, which also features some great pics by photographer Mike Brown. This is a great event for you and your girls or you and the fam! For more information, visit the Apollo Theater website.